Dunedin, Fla. (November 15, 2012) – The ecoVis is a compact, low-voltage light source (400-2500 nm) from Ocean Optics with built-in cuvette holder that’s ideal for basic lab measurements in teaching labs and other research environments. 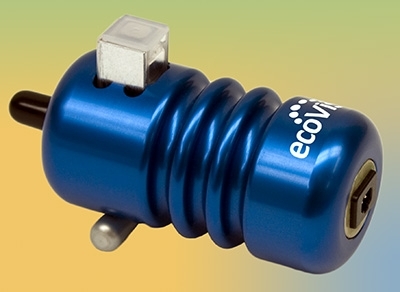 The ecoVis has a rugged solid alloy housing that helps to dissipate heat and in-line fiber ports for absorbance and fluorescence measurements. The ecoVis is small – it’s just 95 mm x 50 mm and weighs 265 g – making it attractive for labs where space is at a premium. The light source has an integrated cuvette holder with 1 cm pathlength and a versatile chromium-plated reflective insert that increases the output for fluorescence, holds the cuvette securely in place and can be adjusted through 90º to block the light path for dark measurements. The ecoVis is designed for absorbance and fluorescence of cuvette-based samples. Its rugged housing and simple design make it useful for teaching labs and setups where basic absorbance and fluorescence measurements are performed routinely.